The Blick Studio Polaris Table by Studio Designs is perfect for sketching and tracing. 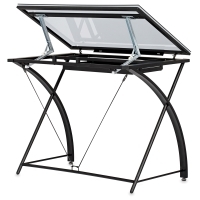 It features a tempered glass top and a durable, powder-coated steel frame. 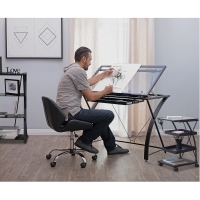 The table includes rear stabilizers for rigidity and two swivel floor levelers for stability. 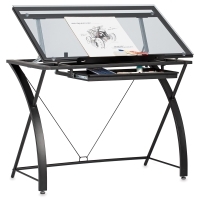 A metal pullout drawer and a slide-up pencil ledge keep supplies close at hand. 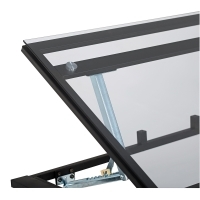 Adjust the tilt angle of the work surface up to 40°. 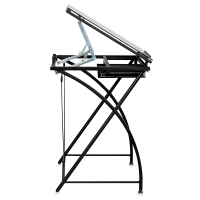 Two tilt mechanisms provide greater support. 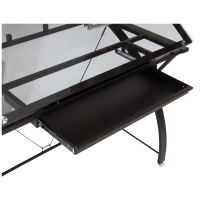 The Polaris Table measures 32-3/4"H × 40-1/2"W × 23-1/2"D overall. For more measurement details, please see the Item Specs tab. Backed by a 10-year manufacturer's warranty. Assembly required. ® Blick and Blick Studio are registered trademarks.™ Studio Designs is a trademark.